You are going to Watch Teen Titans Go! Episode 24 online free episodes with HQ / high quality. Stream cartoons Teen Titans Go! Episode 24 Online Lazy Sunday. 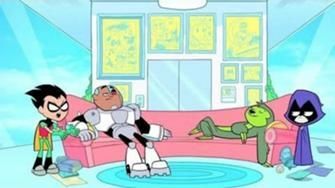 Cyborg and Beast Boy love lazy Sundays sitting on the couch… even when it’s a Tuesday! But when Robin replaces the couch with a treadmill, the two lazy teens must embrace the new active lifestyle.